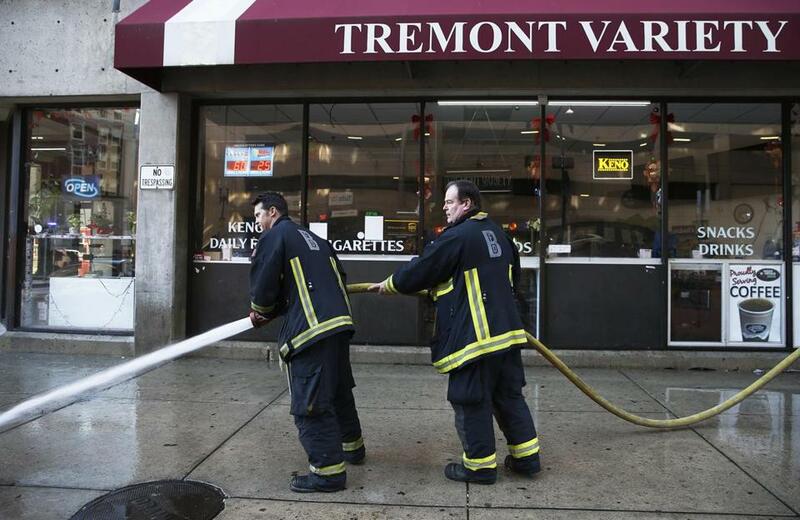 Firefighters sprayed blood off the sidewalk after Sunday’s early morning stabbing on Tremont Street in the Theater District. Seven people were wounded, police say. Seven men in their 20s were stabbed with knives and broken bottles early Sunday morning on Tremont Street in the Theater District, including two who required surgery, police said. Police worked at the crime scene early Sunday. 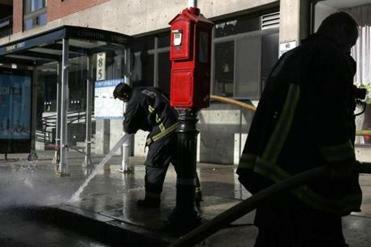 Three of the men were transported from the scene, and four others walked to area hospitals for medical attention, Boston police spokesman Stephen McNulty said. Police received a call at 2:10 a.m. for a person stabbed or shot near 271 Tremont St., shortly after the bars and clubs closed. When police arrived, they found the three men who were then transported. Joe Mellen, 27, an employee for Tufts Parking and Transportation on Tremont Street, said he saw about 20 men punching each other in front of the club and at a nearby bus stop. He said security personnel for the club and for Tufts Medical Center were trying to break it up, but there were too many people involved. No arrests have been made as of Monday morning as police continue to investigate a violent incident that broke out over the weekend. Mellen, who has worked at the parking garage for five years, said he had never seen anything like it. Trails of blood could be seen late Sunday morning in front of the adjacent Royale and Candibar nightclubs, the Courtyard Marriott, the Tremont Variety store, and in a park on the corner of Tremont and Oak streets. Boston police superintendent Bernard O’Rourke, who was at the scene, said one victim, “who did survive some wounds,” is believed to be a suspect in the stabbings. That person fled south on Charles Street South, O’Rourke said. No arrests had been made as of Sunday evening, and no information on a suspect or suspects was available, McNulty said. Boston police Commissioner William B. Evans said Sunday that the incident occurred outside the Candibar nightclub. “People should be able to go out and have a good time without causing all of that chaos and violence,” Walsh said. He said there have been incidents in the past in that area but did not elaborate. Suffolk University and Emerson College alerted students about the stabbings through e-mails, text messages, and phone calls. Boston police detectives canvassed the area Sunday afternoon and were seen looking in trash cans on Tremont Street and in a park nearby. Sanjay Patel, 51, had heard about the stabbings and stopped by Tremont Variety, a convenience store his nephew owns, on Sunday afternoon. Two doors down at the Courtyard Marriott, spokeswoman Lucy Slosser said the hotel was cooperating with police and had security. She said she was not aware of any effect the violence might have had on hotel guests, but staff were available to “direct any information” they had. Residents and students in the area were shocked to learn that such violence erupted in the Theater District. Suffolk University freshman Michael Falewicz, 19, of Billerica, said his parents called him early in the morning to make sure he and his friends were safe after they heard about the stabbings. His friend, Kyle Carver, 18, of New Hampshire, also a freshman at Suffolk University, said the incident was alarming. “I don’t like to hear about stabbings near where I live,” he said. The violence was particularly unnerving for Emerson College junior Poom Nirunwongwan, 20, whose girlfriend lives nearby on campus. Nirunwongwan lives in Brookline and said he frequents the area near where another shooting occurred outside an Allston nightclub a week ago. Any witnesses are asked to call police at 800-494-TIPS. Correction: Because of a reporting error, an earlier version of this story said that a suspect was in custody.